Worn golf grips can keep you from playing as well as you should. When grips wear from age or constant use, they become slick. 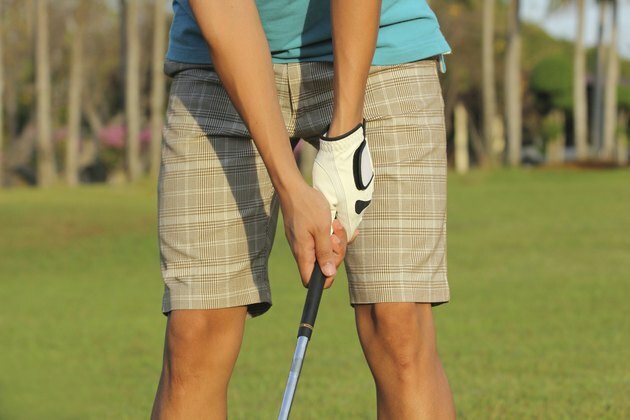 You have to hold on tighter when swinging clubs with slick grips, and that tension in your forearms can restrict your swing and sap distance off the tee. Most grip companies recommend changing your grips once a year or every 40 rounds, but a little maintenance can help keep your clubs' grips in good shape for longer. Lightly brush the grips to remove any loose sand or dirt. Add an ounce of dish soap to 2 gallons of warm water and work the mixture into a lather. Immerse a clean golf towel in the soapy water and squeeze it until it's damp and slightly soapy. Rub down the grips to clean them. You may lightly scrub the grips with a brush if you prefer. Never immerse the grips in the soapy water or under running water to rinse. Rinse the grips to remove any soapy residue by wiping them off with a damp cloth. Rub dry or let air-dry. Wipe down the grips with a clean towel to remove loose sand or dirt. Wet a clean towel with a small amount of water or rubbing alcohol. Rub the grips gently to clean them. Never use soapy water on soft, absorbent grips such as those made by Winn Grips, and never immerse this type of grip in water. Never use brushes on these grips or you will destroy the soft top layer. Gently rub the grips dry and let them air-dry.